This session was presented at the 2018 Soccer Champions Coaches' Clinic by Bobby Muuss, head coach of the Wake Forest Demon Deacons men's soccer team. Find out more about the Soccer Champions Coaches' Clinic. Progress with each pattern to make it more complex. Rotate central players after each pattern. There are lots of patterns you can use in this set-up. We often will also have a goal behind the starting side, so the pattern goes up, and then on the way back it finishes with a shot on goal. 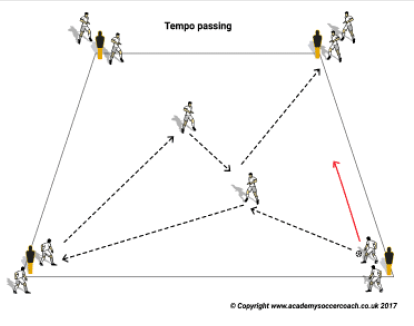 Warm-up passing exercise that focuses on combination play, movement off the ball, and allows players to open up their legs. Emphasis on clean first touch and passes to get a rhythm. Drill starts with entry pass into the forwards feet. For the first round, 1 defender is out and on the forwards back. As ball is played in, one winger joins the attack and it is 2v1 to goal. Switch which side the run comes from each time. From there, progress to having 2 defenders start out and both wingers join the attack at the same time. Forward movement to check to the ball and create space. Forward feeling where the pressure is coming from to know if he can turn or needs to lay to runner. Timing of runs from wide players to try to get the ball on the move running at goal. Defensively, make everything predictable. Cut off half the field, and try to make it a 1v1 or 2v2. Two neutrals are targets on the ends, one neutral is in the central channel, and one neutral travels from box to box. The goal is to connect through the neutral player in the central channel and get to the target on the opposite side for a point. Coach is on one side in the middle with balls. Team with the ball needs constant movement and recycling and playing the ball. Emphasis on body position to give yourself the opportunity to play forward and find the neutral in the center channel. Defensively, stay compact and cut out central passing lanes. When we win the ball, how quickly can we transition to attack and find the neutral in the channel? If they break down the defense through zone 14, they are free to goal. If it’s wide of the zone then it’s live. Defenders have a line of 4 with 2 defensive midfielders and try to find coach when they win the ball. Keys for the attacking group are constant movement off the ball and keep the ball rolling. Can we penetrate centrally instead of settling for wide play? Keep the attacking group wide, and track runners on service.